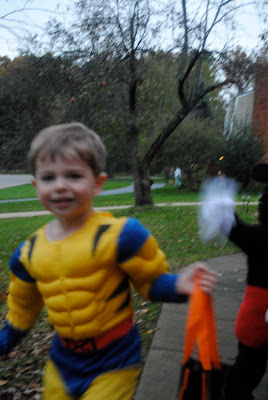 I have to say, that the hardest day to photograph my grandsons', has to be Halloween. They are all climbing the walls with excitement and that means they never stop moving. You really have to get their attention to get them to stop, even for a second. Hence...blurry photos. Here's Ryan. He was Wow Luigi?! (I sure hoped I finally spelled that correctly.) 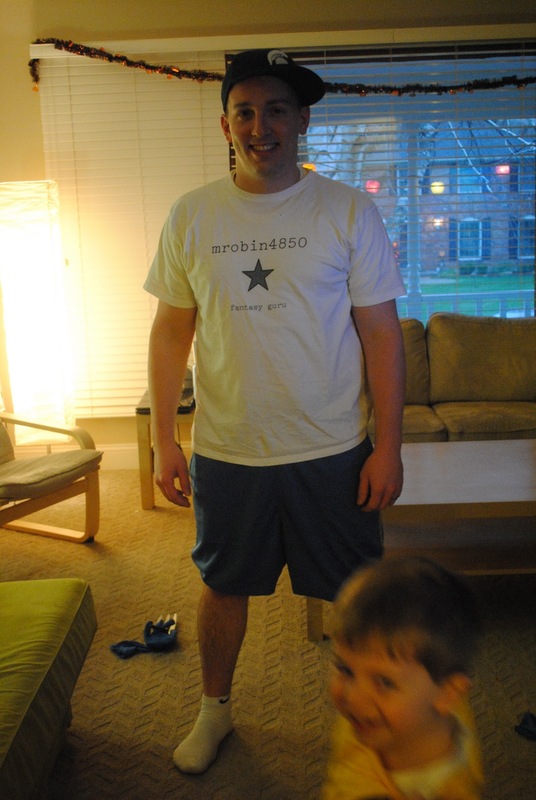 It's a character from the Mario video games and he wouldn't wear his Wow Luigi hat, so he just looks basically normal. Although, I can't get over how much he's growing and looking like...a kid. Austin was Wolverine and he wouldn't wear his hat/mask or gloves, but he's sure wearing that six-pack. 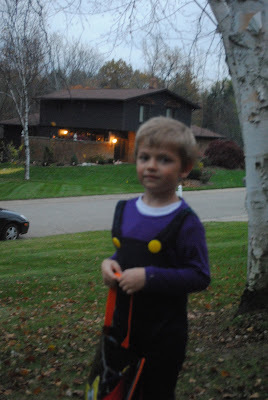 And Baby Luke was Mickey Mouse and oh, how I wish this photo wasn't so blurry. But I think you can see just how adorable he was. Most hilarious costume of the night went to my SIL, Rick who dressed up as Mikey (my son). It just cracked me up and when I sent a photo to Mikey saying "guess who Rick dressed up as?" he immediately knew it was him. Later, Rick put on a hoodie sweatshirt and said "OK, now I'm Mike going out". Classic. The six pack on your grandson is enviable. I love your halloween pics, I can just feel the energy emanating. Those boys just won't quit growing! I absolutely luv seeing kids in their Halloween costumes. Interesting about them not wearing the masks because Phillip never wanted to either. This year was the first time he did. Looks like there was lots of fun at your house. Thanks for the acorn squash cutting information. You'd think that at age 63 I'd already know it. Happy Saturday to you, Lindalou.